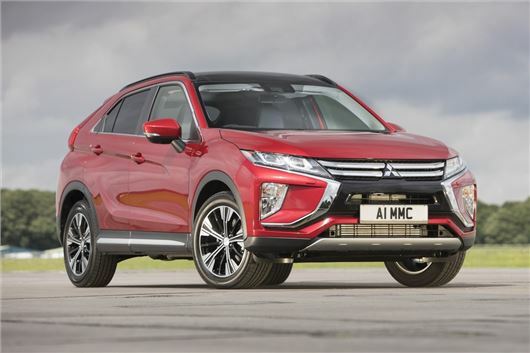 Mitsubishi's new Eclipse Cross will be priced from £21,275 when it goes on sale in the UK in January 2018, giving us yet another new crossover on the market. It will rival the new Skoda Karoq and the recently facelifted Nissan Qashqai although initially there will be only one engine available. This is a turbocharged 1.5-litre petrol which has 163PS and 250Nm of torque - but expect a PHEV model to follow soon after. A six-speed manual is standard while there's an optional CVT automatic that Mitsubishi says has the 'smoothness and responsiveness' of a traditional automatic. Top versions will come with four-wheel drive but expect most models to be two-wheel drive. The rear seats feature the usual 60/40 split but usefully have eight different recline settings while the bases slide forward by 20cm. The entry-level '2' model isn't particularly cheap at £21,275 - a SEAT Ateca starts at around £18k - but the Eclipse Cross does come well equipped with 16-inch alloys, climate control, lane departure warning, heated door mirrors, DAB, a touchpad controller, Apple CarPlay and Android Auto plus a reversing camera. The Eclipse Cross '3' starts at £22,575 and adds 18-inch alloy wheels, a head-up display, heated front seats, front and rear parking sensors, keyless entry and keyless start, electrically folding door mirrors and an electronic handbrake on automatic versions. At the top of the range, the Eclipse Cross '4' comes with leather upholstery, an electrically-adjustable driver’s seat, electric opening panoramic roof and a Rockford Fosgate Premium sound system with nine speakers. Pricing starts at £24,975. There will also be a First Edition model, which seems to have become de rigueur these days. It's based on the 4 and adds 'premium paint', carbon-finish bumper corner and side extension kit with red inserts plus special First Edition floor mats with red trim. Only 250 cars will be produced priced from £26,825.